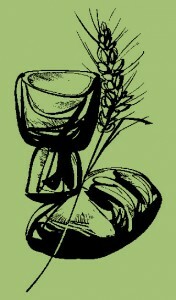 There are many people who help us to celebrate our liturgy in the parish; some, such as altar servers, readers, musicians and eucharistic ministers come readily to mind but others, such as flower arrangers, welcomers, those who take up the collection and present the gifts, also have an important role to play. Another essential role or ministry in the parish is that of Catechist, people who give their time, often making a regular, behind-the-scenes commitment over many months, helping to prepare candidates to meet God in the sacraments. If you think you would like to join the ranks of one of these ministries then speak to Fr Sean or have a word with someone you know who is already involved. Assisting the priest in the celebration of Mass and other services has long been a way of developing a deeper understanding and love of the richness of the Church’s liturgical celebrations as well as being a very visible sign of service. It is a ministry which, today, is open to any Catholic who has made first communion and we are pleased to have a number of men serving alongside our young people – it would be good to see some women as well. Contact the Parish Priest or the Parish Office if you are interested in becoming a server. Training is given and, as ability and understanding grow, our servers progress towards full membership of the Guild of St Stephen. The Archconfraternity of St. Stephen has its own website which can be accessed here. It contains useful information about events as well as a regular newsletter. Preparing people to meet God in the sacraments is a responsibility which is taken very seriously in the Parish. We are fortunate to have a mix of both lay people and religious who prepare parishioners. Preparation of our young people for the sacraments of Reconciliation (Confession), Holy Communion and Confirmation is carried out by teams of catechists who, with parents, work with the candidates. The Parish Priest deals with preparation for the sacraments of Baptism and Marriage. A further group follow the Rite of the Christian Initiation of Adults (RCIA) and prepare adults who wish to be baptised, confirmed or to enter into full communion with the Catholic Church. Our Eucharistic Ministers give a solemn undertaking to serve the Parish, to assist the priests and the people of our community by distributing Holy Communion at Mass, by administering the Eucharist to the sick in their homes. At the heart of this commitment is the resolution to deepen one’s faith, to live according to the Gospel values and to develop a deep love, reverence and devotion to Our Blessed Lord in the Eucharist. If you feel called to share this ministry, please contact the priest. Special Ministers of the Eucharist are commissioned on a yearly basis. Note that Special Ministers of the Eucharist have to pass Safeguarding checks before being allowed to bring Holy Communion to the sick or housebound. The Liturgy Commission has produced a number of leaflets and other materials to support Eucharistic Ministers. More information can be found here. Music is the language of the soul and it is one that we all speak whatever our cultural background. In the same way that we use music at celebrations to commemorate events in our lives, so too, when we come together as a parish community to praise God. St. Augustine said that when you sing you pray twice! At St. Peter’s, the 9:45 and 11:15 liturgies are ‘sung’. Hymns and music reflect the theme of the Mass and readings of the day. Within the Church we are fortunate in having many rich musical traditions on which to draw when selecting music. The 9:45 Mass is slightly more traditional. The choir uses guitars, the organ and other instruments in the celebration. Instrumental pieces are sometimes played during the Offertory Procession or Communion. The 11:15 celebration is a Family Mass and hymns are appropriately children-centred, with lots of percussion instruments – drums, maracas etc. to accompany them. We hope that in our choice of hymns and music, there is something for everyone. You may hear many of the same hymns at both masses – although probably in different styles! We always welcome feedback and comments. Remember, our musicians and choirs are here to assist you in your singing, not to do it for you. However, we are always on the lookout for new recruits so, if you play an instrument or have a reasonable singing voice, come and speak to us after Mass – we’re here most Sundays. Be still and listen to God’s voice within you. His are the words you enflesh,. Trust in his unending love. Speak his word in confidence and with love. for this instant and for all eternity. The principle role of the Reader is to ensure that everyone is able to hear the Word of God. 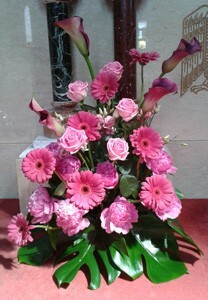 Our Readers proclaim the scriptures at weekday as well as Sunday masses. As well as technical ability, this ministry calls for a particular love for the scriptures. If you feel you have a gift for this important ministry, please contact the priest or speak to one of the readers. Help and assistance are available for new readers, and courses are run from time to time. Click on a heading to show or hide information. There are about 20 readers on the rota for the 11:15 Sunday Family Mass, some in year 7 (secondary school), the rest in years 4 to 6. 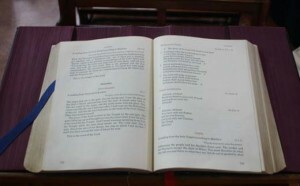 A rota is published approximately every three months during the academic year and readers would expect to read twice per rota; usually once doing the first reading and once doing half of the bidding prayers. There are usually five to six bidding prayers and so they are shared between two readers. All our readers have been given training where they will practice walking up to the lectern, adjusting the microphone and reading text. Attached to each rota, which is sent to all readers, are guidelines on best practice for reading at Mass. The readings and bidding prayers, which are edited ensure they are appropriate to the younger reader are sent out on Friday evening or Saturday morning. If people have to cancel due to sickness etc., others fill in as required. If you or one of your children are interested in becoming a reader at the 11:15 Family Mass, then speak to Fr Sean or contact Kathleen Conneally who organises the rota and will arrange training. These are the notes from a series of training sessions given at St Peter-in-Chains in July 2010. Our thanks to Charles Serio who prepared and gave the sessions and has allowed us to reproduce his notes. As the Spirit manifests itself through ‘Wind and Fire’, so we need Wind and Fire to express the Living Word. The Wind is our Breath. The Fire is our interpretation of the reading and its momentum. I accept that I ‘will be seen’. I accept that I ‘will be heard’. So I intend to be seen and I intend to be heard. These are “Givens” and we must accept that. When nervous or fidgeting, I check my body position. What is in contact with the floor is in touch with the floor (Feet). My head is level-neither raised nor lowered (Head). My hands are on the lectern or ‘heavy’ by my side (Hands). Don’t tell yourself to relax, do something to relax. To prepare myself to give my reading, I do the following. I begin by saying a prayer to the Spirit so as not to get in the way of His Word. As I begin to walk to the altar, I look for something in the Church that I did not notice before. I do this to ‘draw myself out’ and to get out of the Little Room (My Head) and into the Big Room (The Church). I feel my body displace the air as I walk in order to draw myself out of myself. As I approach the lectern, I check and/or adjust the microphone so that it is level with my mouth as much as can be possible. I do not ‘lean into’ the microphone. I keep my head level. I let the microphone do its job. Then before I begin my reading, I BREATHE. As I read, I imagine that there is a stream of air carrying my words away from me. This helps me to avoid swallowing my words. It also reminds me to breathe throughout my reading. I try to speak to the end of a thought or idea on one breath. Then breathe again to express the next thought or idea on one breath. There should be a ‘forward momentum’ in the reading. Not raced, but paced. Try to avoid breathing in the midst of a single thought or idea. It breaks up the momentum of the reading. It also causes a disconnection with the congregation. As I read, I try to project my voice just beyond the people furthest from me. I imagine my voice enveloping the congregation. This allows me to ‘let my voice out’ and helps with clarity and making my reading easily heard. This is about articulation. If a letter in a word is sounded, then it must also be sounded in the reading. Work to be clearly heard by sounding the letters in words that should be sounded. Watch out for sounded letters in the midst of words such as ‘Judge’ as well as final stop consonants. 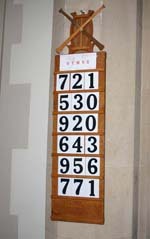 This allows our reading to be clearly heard and prevents the congregation from having to work to understand us. Preparing our reading and preparing to give our reading are two distinct activities. When preparing a reading at home, look for the places where one should breathe. Look for the sounds that should be articulated in every word. If possible, practice your reading aloud to one other person. Work to convey the reading to them as an individual. This allows us to develop a sense of connecting our reading to the listener. Use a source of your choice to understand the “Key Point’ of your reading. A couple are suggested in the ‘Resources’ section.